Restores vertebral joints to their physiological relationships of motion (realigns your spine). This technique is a gentle, non-force procedure that aids the spine in healing properly and to ensure a pain free future. Cox® Decompression Adjusting is the well-documented, researched, proven effective, non-surgical technique for treating low back pain. If the disc “slips,” the inner nucleus (a gel-like material) escapes into the anular fibers (rubber band-like and elastic so as to allow spinal movement) and can cause just low back pain or press back into the spinal canal to compress a nerve which causes pain down the leg where the nerve travels. This leg pain is call sciatica. 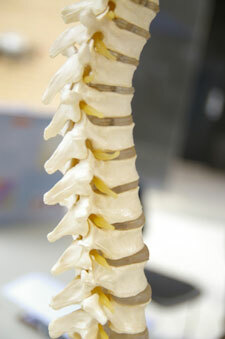 Cox® Technic may gently open the disc space enough to give space for the nerve to “breathe” and not cause pain. The first 72 hours after your back injury are important to reduce inflammation. The doctor will do a thorough examination, which may include any or all of the following: a history of any back and health problems in your past or your family’s past; physical, orthopedic, and neurologic testing; and x-ray. (Bring any MRI’s, x-rays, CAT scans, myelograms, etc., that you have had taken recently.) When the examination is complete, your diagnosis and suggested treatment plan will be shared with you and your family. For up to 6 weeks, your body begins to heal itself and the most crucial to your back’s future health. You should feel and sleep better. The injured muscles and fascia between muscle layers heal with scar tissue, which forms differently than normal tissue. This scar tissue is not as strong or elastic as normal tissue. So, DON’T BE DISCOURAGED if pangs of the old pain return. It is natural and makes it important to continue working with those muscles in a controlled fashion, using Cox® Decompression Adjusting to regain pain-free, pre-injury movement with strength and full range of motion. For 6 to 12 months, your spine continues to heal. You should continue as instructed in Stage 2. It is very important to continue rehabilitation and exercises. Research shows that patients who continue rehabilitation even after “feeling better” have less scar tissue formation and have more strength, flexibility, better cartilage nutrition, and less chance of recurrence of injury. Surgery is necessary for less than 2% of low back pain patients. At least 6 to 8 weeks of active non-surgical care (chiropractic) should be given before surgery is considered, unless neurological problems such as urination difficulties or progressive muscle weakening occur. Give our Muskegon chiropractic office a call to learn how Cox Decompression can help you or someone you know.